Did you know it’s pineapple and mango season? Before I started eating differently, I never really considered eating food that was in season. Because we live in a place that carries every type of produce all year long, it’s easy to overlook the importance of eating seasonally. And since pineapple and mango don’t grow in my area anyway, it’s even easier to miss their peak time. As it turns out, mango and pineapple season is right now! Granted, they still have to travel a distance to make it into my bowl. Yet they taste most delicious in their prime. Both mango and pineapple taste magical in smoothies and on their own, yet I wanted to give them a little makeover and turn them into salsa. These sweet and juicy fruits are mixed with creamy avocado, a sweet and salty lime dressing, and topped with crunchy green onion. But I didn’t want to stop there — the salsa needed a few other companions, so wild-caught shrimp and quinoa it was! When it comes to shrimp, we all know that farm-raised is a big concern. If you can't find wild-caught shrimp in your area, both US Wellness Meats and Vital Choice sell it online. This recipe is truly one of the easiest! The longest part will be the soaking of the quinoa, which involves zero extra effort yet is infinitely better on your digestion. The shrimp take merely a few minutes to grill, and then your tastebuds will do a happy dance! 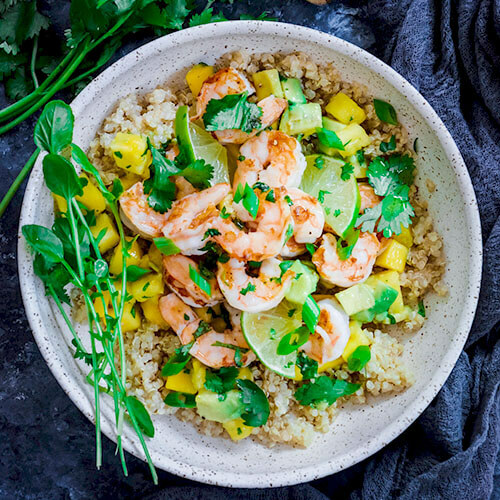 Check out this speedy, sweet and salty grilled shrimp with mango avocado salsa, and let me know what you think! Wondering what to serve with grilled shrimp? It's pineapple and mango season! 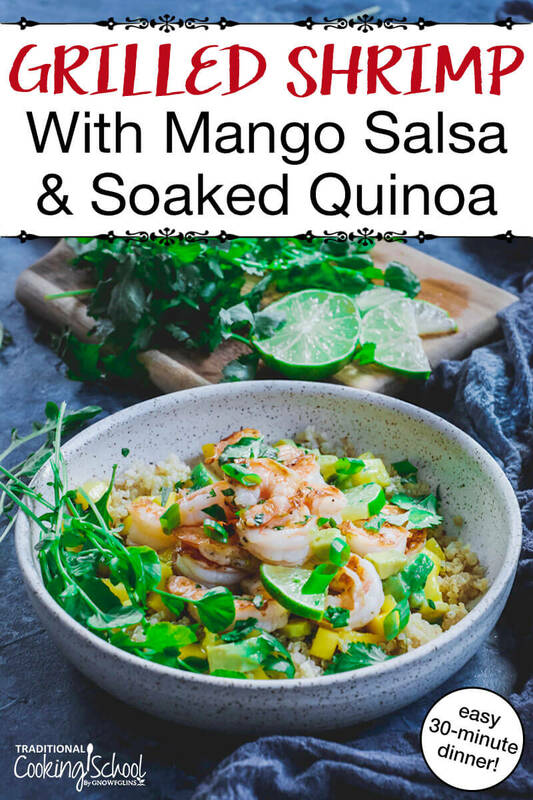 Indulge these juicy tropical fruits to the fullest with a grilled, wild-caught shrimp and soaked quinoa dinner... topped with creamy mango, avocado, and pineapple salsa and sweet 'n salty lime marinade. Packed with fresh and healthy whole foods, yet so easy it takes only 30 minutes in the kitchen, you'll wonder why you haven't made this recipe before! The night before, combine quinoa and 4 cups water in a medium-sized pot. Let sit, covered, overnight or for up to 24 hours. The next day, combine all shrimp ingredients in a container with a lid. Let sit for 15 minutes. Drain and rinse quinoa well under running water. Add back to medium-sized pot with broth. Bring quinoa to a boil, then reduce heat and simmer for 15 minutes with lid on, until all liquid is absorbed. Let sit for 5 minutes. In a medium-sized bowl, combine these salsa ingredients: olive oil, lime juice, salt, and honey. Whisk vigorously. Remove 3/4 of this marinade, and reserve. Leave the rest in the bowl. Add cubed avocado, mango, pineapple and cilantro. Mix well and set aside. Heat grill pan or grill. Cook shrimp for 2 to 3 minutes per side, or until pink. Fluff quinoa with fork. Add reserved marinade, and combine. To assemble, layer quinoa on plate. Add salsa. Top with shrimp. Garnish with additional cilantro and green onion. What is your favorite tropical fruit-inspired dish? Is there any other food you'd like to pair with this mango salsa? 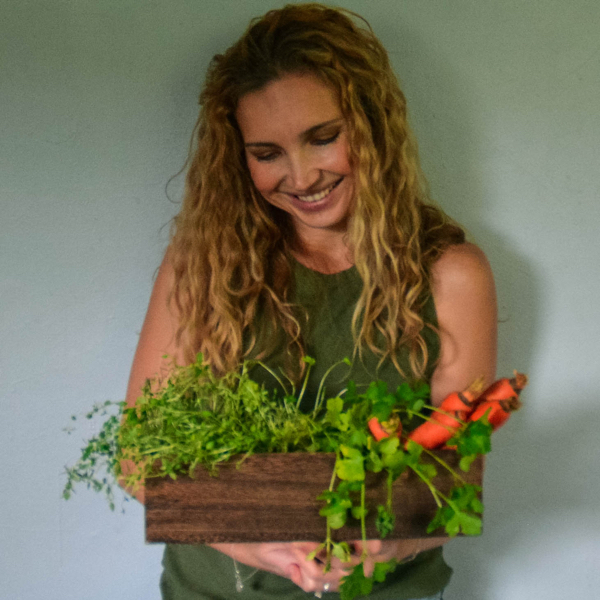 Daniela is a kombucha-drinking, gut health-focused blogger at Calm Eats. Growing up in Romania, she learned to love being in the kitchen and cooking from scratch. Food sensitivity later in life, however, has prompted her to shift focus by cooking seasonally without gluten or dairy while sacrificing none of the taste. She resides in the Philadelphia area with her husband and two small children. She loves photography, writing, the ocean, and empowering others to take gut health into their own hands by cooking and eating real food.